With modern technology all of these moments translate into immediate action. Remember, users are on the go when they these moments arise and they have a comprehensive piece of technology in their fingertips to produce instantaneous results. Plumbers must take advantage of this opportunity. 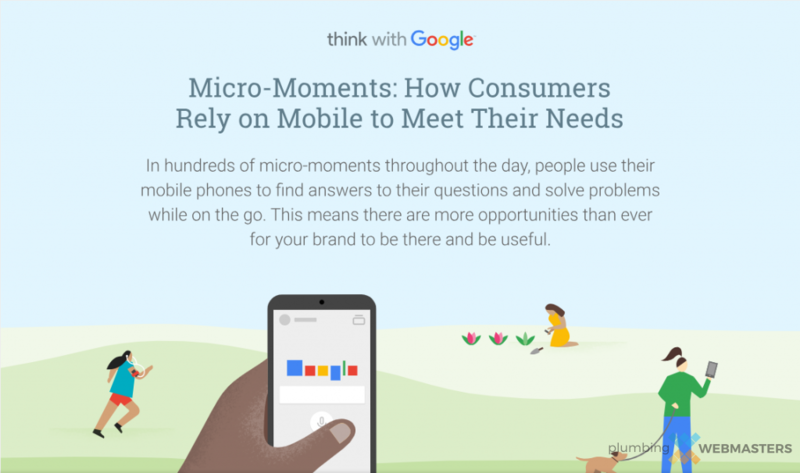 How Plumbers Can Optimize Micro-Moments? In the past 2 years local searches that included the words near me have increased by 900%. Similarly, nearly ⅔ of mobile users are more likely to choose a company that customizes content to specific locations. In the case of plumbers users will only be interested in plumbing services within a certain radius, whether that is a zip code, county, or a metropolitan area. Mobile micro-moments are the cutting edge of internet marketing in 2019. Companies that win these moments will earn the most revenue this year. This is the time to invest in learning, anticipating, and ultimately capitalizing on micro-moments. Plumbing Webmasters offers internet marketing services to plumbers throughout the United States. We are ready to help you win these moments. Other marketing agencies exist online but not many of them specialize specifically in the plumbing industry. Those that do tend to use sales routines that are not relateable to the hard working contractor. Plumbing Webmasters is different because we care. With years of experience working with plumbing contractors we are at forefront of marketing research and help give our clients an advantage over competitors. Updated on April 11, 2019 at 6:50 pm by Plumbing Webmasters.